Well, the ‘why' comes down to one thing. “TRAFFIC.” Having keywords in your website's content as text, whether it be in the title of your articles, or in the body of the content if you want web traffic to come to your website. Now the search engines are going to find these keywords, and decide where they should rank your article. What is a Spider Bot or GoogleBot? Well, Googlebot is Google's web crawling bot (sometimes also called a “spider”) and its function is crawling new and updated pages to be added to the Google index. They use a huge set of computers to fetch (or “crawl”) billions of pages on the web. These bots are on the move all the time. So, for your website to compete, you must have relevant keywords. Without them, it would be near impossible to be ranking where it matters. Here is a short video showing you a real case study to show that a tool like Jaaxy really works. The power of this tool to find the keywords that will launch the ranking of your website is unimaginable until you see it for yourself. Watch this video – it's only 4:44 minutes long. 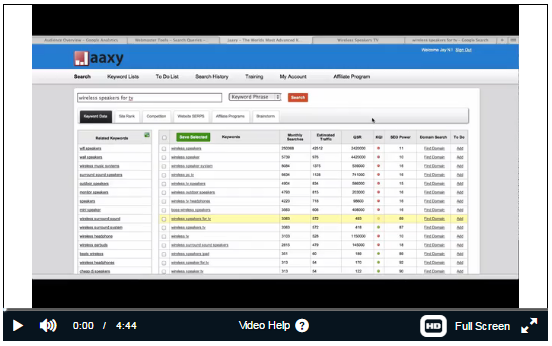 Jaaxy Enterprise can precisely and accurately obtain the right keywords for your website's content in a snap! But that's not all! 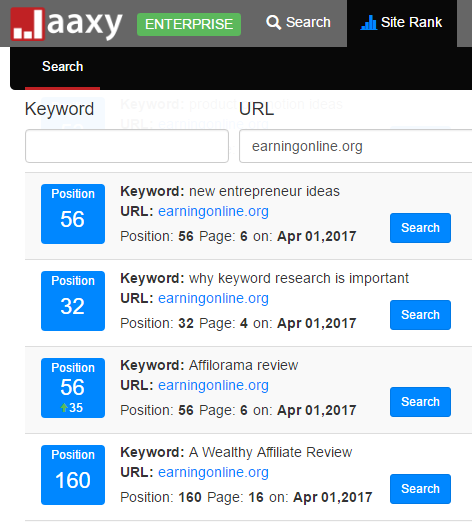 Jaaxy has a Site Rank feature which allows you to search for a keyword from a post on your website as shown in the following screenshot. You can see that there are four keyword results showing in this next screenshot, and it shows what position in the SEO rankings each of the keywords are in. It also states what SERP (Search Engine Results Page) it is sitting in on Apr 01, 2017. So, my keyword phrase ‘new entrepreneur ideas' on my website ‘earningonline.org' is in 56th position on page 6 on Apr 01, 2017. But the best result out of the four you see here is the keyword phrase ‘why keyword research is important' in 32nd position on page 4 on Apr 01, 2017. I can do a search update every few days or so to keep track of all the keywords I place in the search bar in Jaaxy. It’s been a couple of months since I realize the importance of keywords in online marketing. It really makes a difference to know how to use them properly. Jaxxy looks like a great tool to make the most of the keywords and get real traffic to your site! Thanks a lot for the review and the tips! Thank you for stopping by and for your comments. Jaaxy is definitely an important tool to have under your belt and for finding the keywords that will make a difference to your SEO rankings, therefore, increasing traffic to your site. Keywords are really important and Jaaxy truly does show you the best way to get them. And it gives so many variations of one keyword which then gives you so many ideas for content. I love the site rank feature also to see where my posts are ranking. Good information here Rina and I definitely recommend Jaaxy as well! Hi Rina, great article on the power of Jaxxy! I am a member of WA and Jaxxy myself, and I can attest to the fact that Jaxxy works. I watched Jay’s short video you shared, and I can see the power that Jaxxy has, and is extremely accurate! Thanks for writing the article, it explains simply and accurately why Jaxxy is definitely worth the time and money to use to get ranked! Thank you Eric for your comments.